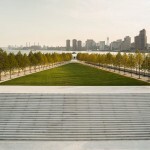 Was Louis Kahn’s Four Freedoms Park inspired by the Masonic Pyramid on the $1 bill? 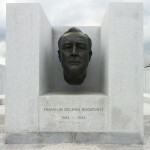 The Franklin D. Roosevelt Four Freedom’s Park may have opened relatively recently in 2012, but architect Louis Kahn was brewing up the design for the memorial park nearly 40 years earlier. Kahn’s death in 1974 (a somewhat tragic one which left him dead and alone in a Penn Station bathroom after a heart attack) was unfortunately accented by a dwindling reputation — Kahn’s sordid multi-family affairs had come to light upon his passing and his fading architecture practice was loaded with debt. But beyond all the scandal, Kahn also left behind a number of sketchbooks packed with complete sets of unrealized projects. 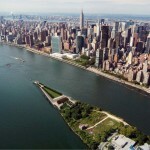 One of these projects was the Four Freedom’s Park. 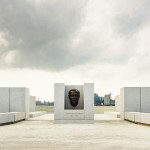 While plenty of accolades have been given to successful realization of the project so far after Kahn’s death, few have tracked where the architect may have pulled his inspiration for the design. That is until now. 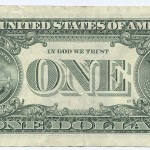 As a number of Kahn’s sketches emerge for public viewing, some are asking: Was the the design of Louis Kahn’s Four Freedom’s Park inspired by the Eye of Providence found on the U.S. dollar bill? 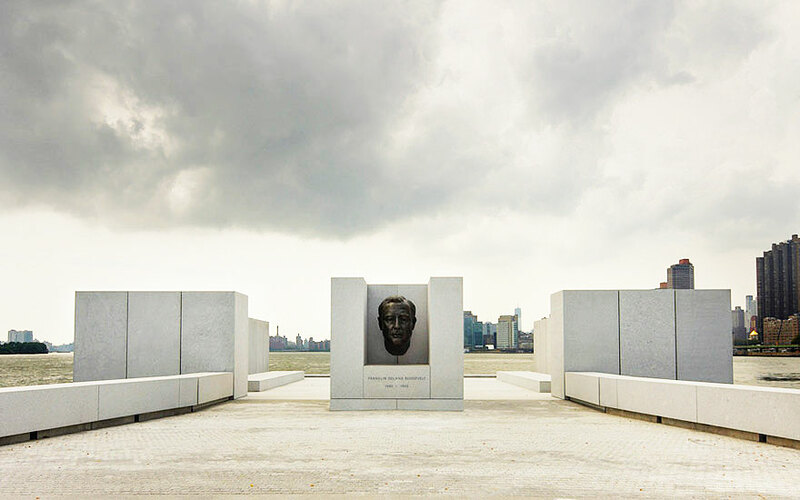 In 1973, Kahn was commissioned by Governor Nelson Rockefeller and NYC Mayor John Lindsay to design the memorial space for FDR. 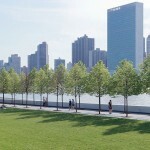 Though Kahn finished the design just a year after receiving the assignment, the project was put on hold due to New York City’s approaching bankruptcy. Its delay was further extended by the architect’s death, and the initiative was eventually lost until Mitchell | Giurgola Architects took on the task of realizing Kahn’s work based on his drawings decades later, in 2010. 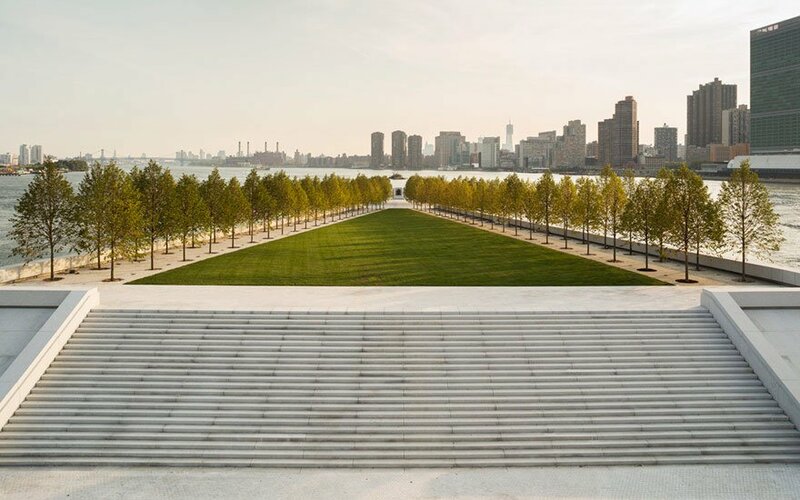 With little record beyond Kahn’s plans and sketches, a recent Guardian article by Olivier Wainwright speculates that the architect took inspiration for the park from the Masonic symbol that FDR (a freemason himself) introduced in 1935 on the back of the one dollar bill. According to the Guardian, many of the drawings within Kahn’s sketchbook depict triangular or pyramidal shapes that range from a “box, from which extends a long, tapering, indistinct landscape” to geometric comet-like formations with trees trailing behind, to what’s more clearly a reference to the banknote in question: a clipped triangle topped off with an all-seeing eye. 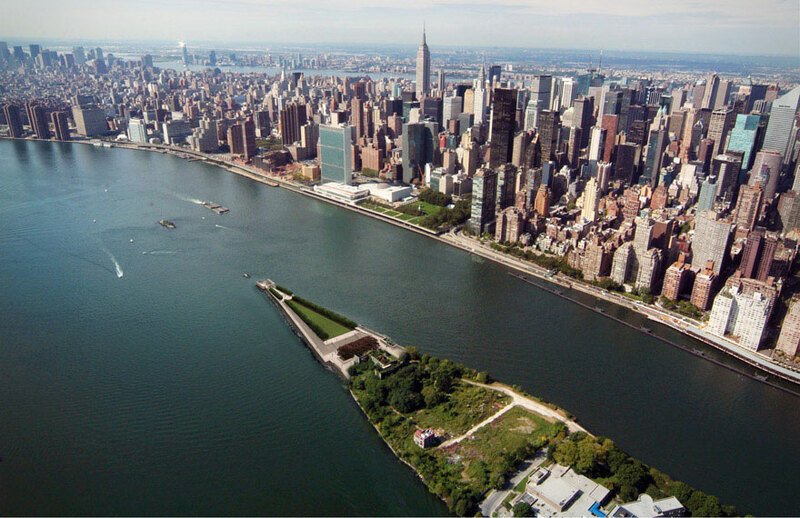 Sited at the tip of Roosevelt’s Island, the shape of the park is definitively a pointed triangular formation — though many would contented that it’s a ship’s prow, referencing FDR’s love for the sea. The elegant design also makes for a temple-like space with its subtle and poetic geometric forms and its play of light and perspective through careful angles and surprising vantages. And like the Eye of Providence, the park concerns itself it the welfare of humankind with points all throughout the park paying homage to the four essential freedoms FDR wholly believed in: freedom of speech and expression, freedom of worship, freedom from want, and freedom from fear. So, could this all be a coincidence? If you want to get in on this game of ‘architecture conspiracy theory’, let us know your thoughts in the comments below. We also highly recommend paying a visit to the park to get a look for yourself. 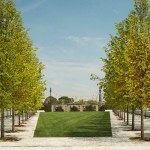 Four Freedom’s Park is open all summer 6 days a week, Wednesday thru Monday, from 9 am to 7 pm. Just don’t forget your $1 bill.